Ameloblastoma is one of the most common tumors from odontogenic epithelium. Although clinically classified as benign, ameloblastoma has a high risk of recurrence because it is locally invasive, making it an important neoplasm to research on. Several histopathological variants of the tumor are known, and cell differentiation in the same tumor may be observed. Thus, investigation on the differentiation of tumor cells is an important research aspect for its therapeutic management. Routine hematoxylin and eosin (H and E) examination helps us observe different histological varieties of ameloblastoma. However, H and E cannot comment on how a particular histological type is being established or the behavior of that particular histological type. In this study, our molecule of interest is heat-shock protein 27 (HSP27) which might help us comment on this aspect. 27 kDa HSP27, which is also identified as p29 estrogen receptor-associated protein, plays a crucial role in specific growth stages. It also seems to be involved in the balance between differentiation and apoptosis. The spatiotemporal expression of HSP27 is essential for normal mammalian development and growth. HSP27 plays an essential role at different stages of tooth development also. It is localized in human tooth germ and is essential for its growth. Once odontogenesis is complete, there are areas in maxilla and mandible where we can find remnants of odontogenic epithelium. It has been suggested that these remnants can give rise to various lesions such as odontogenic cysts and tumor, most frequent being ameloblastoma, a locally aggressive benign neoplasm which has a wide spectrum of histological patterns that resemble the early stages of odontogenesis. To compare the expression in developing tooth germs and ameloblastoma. Orofacial complexes of five abortus fetuses between 9th and 18th weeks were processed for fetal sections and ten formalin-fixed paraffin-embedded tissues for ameloblastoma were taken up from the archives of the Department of Oral Pathology and Microbiology, Mahatma Gandhi Postgraduate Institute, Puducherry. 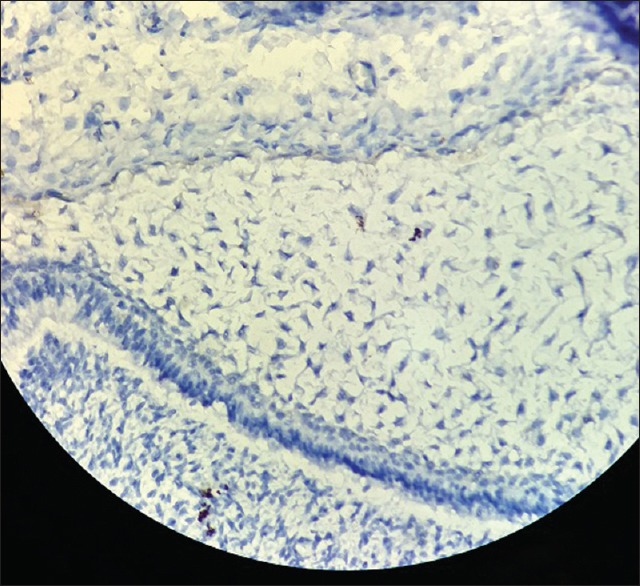 All tissues were stained for H and E and anti-HSP27 antibody using immunohistochemistry. Sections measuring 3 μm were cut and placed on poly-L-lysine-coated slides. The sections were deparaffinized at 65°C for 15 min and subsequently two changes of xylene were done for 10 min each. The sections were hydrated with decreasing concentrations of absolute alcohols (100%, 80%, and 70%) and rinsed with distilled water. To unmask epitopes, the heat-induced epitome retrieval technique was used with sodium citrate solution (pH 6.2) using a pressure cooker at 120°C for 8 min with one whistle. The slides were then allowed to cool to room temperature and subsequently rinsed with distilled water. Endogenous peroxidase was blocked with hydrogen peroxide, followed by washes with distilled water and phosphate-buffered saline pH 7.4. Monoclonal primary antibodies were incubated against HSP27 (BioGenex) for 30 min. The sections were then incubated with super enhancer for 20 min and horseradish peroxidase-polymer-secondary antibody for 30 min. The products of the reaction were visualized with 3.3'-diaminobenzidine-H2O2 substrate. The sections were counterstained with Ehrlich's hematoxylin and dehydrated by increasing gradient of alcohol (70%, 80%, and 100%) and finally immersed in xylene for 5 min for clearing. The sections were dried and mounted using DPX and coverslipped. 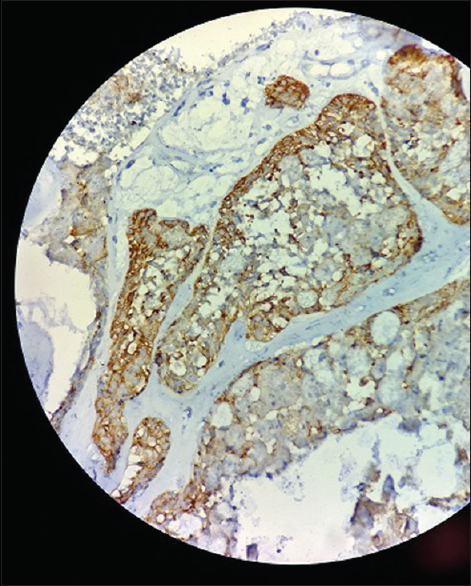 Sections stained for HSP27 were examined for the presence of brown cytoplasmic staining and evaluated by locating the epithelial areas most heavily stained by scanning the section under low-power magnification ×4 objective lens [Figure 1]. 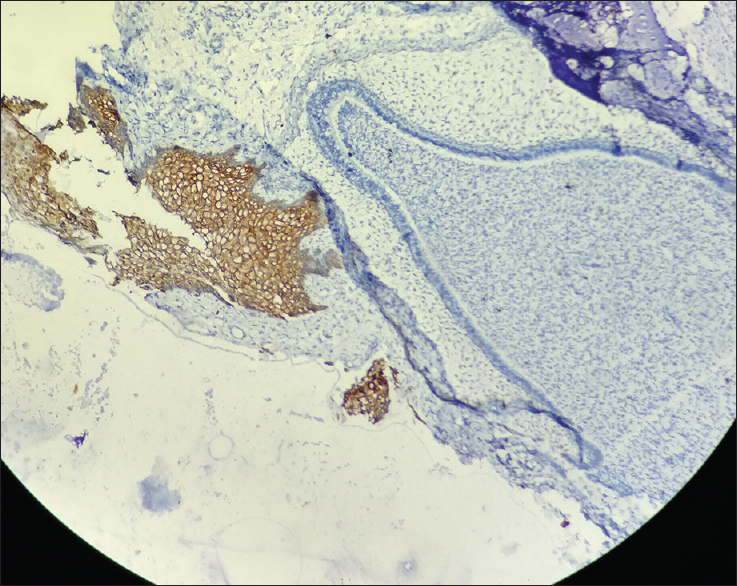 H and E-stained sections of corresponding sections were used for comparison and proper identification of cells. Five cases of fetal orofacial complexes were studied to demonstrate the presence of HSP27 in developing tooth buds. Ten cases of ameloblastomas were studied to demonstrate the presence of HSP27 the tumor cells. The mere presence of brown color was taken as a positive signal in the tissues and intensity was not taken up as a criterion in this study. Of five fetal tissues, all the tissues showed positivity of HSP27 in various stages of developing tooth buds. Dental lamina was found positive with HSP27 in all the five cases; succedaneous bud stage was found positive in two of five cases. Stellate reticulum and outer enamel epithelium were found positive in one each of five cases and inner enamel epithelium (IEE) was negative in all five cases [Figure 2] and [Figure 3]. 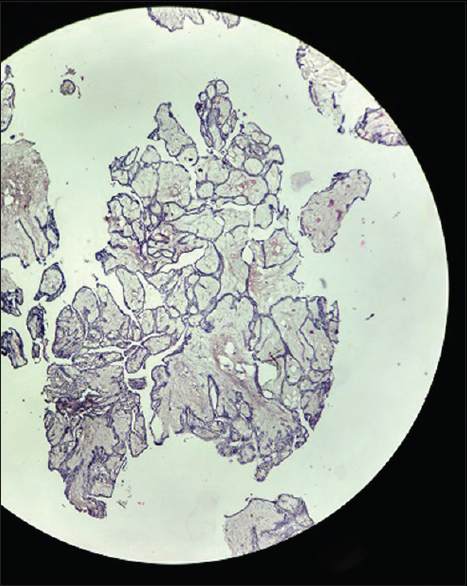 In ameloblastoma, ten cases were studied in which positivity was seen in the columnar or cuboidal cells of the tumor islands [Figure 4], [Figure 5], [Figure 6], [Figure 7]. Ameloblastomas are locally invasive and slowly growing odontogenic tumors in the head and neck region. They are highly aggressive benign tumors with a malignant potential and also exhibit a high recurrence rate after surgical procedures. Radiographically, ameloblastoma appears as multilocular radiolucency, sometimes showing perforated cortices. Furthermore, a tooth root resorption is a frequent radiographic observation. 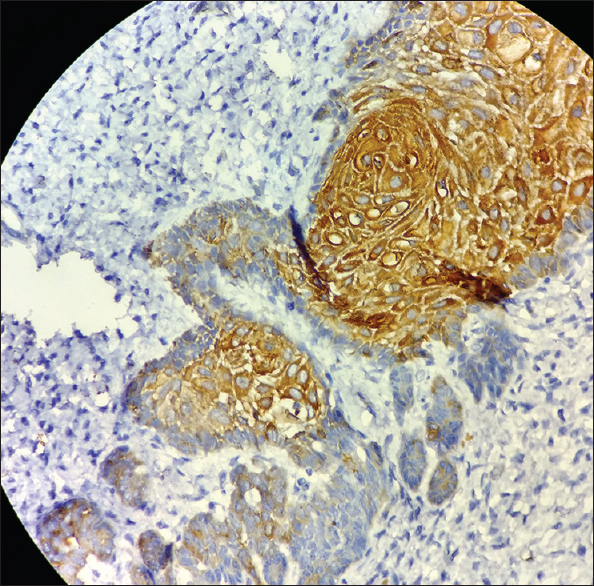 The similarity of these characteristics with renal cell carcinoma metastasis and giant cell tumors warrants a histopathological examination for a final diagnosis. Ameloblastomas originate from epithelium of the developing tooth, including cells of the enamel organ and dental lamina. The palisading, with polarization of the nuclei in basal cells, is considered as a common characteristic of ameloblastoma and was the main histologic factor that led to identification of ameloblastoma as a neoplasm resembling the dental organ, the fetal tooth-forming structure. The differentiation level of ameloblastoma cells corresponds to the differentiation level of the odontogenic cells in a tooth germ. Ameloblastomas are also characterized by other clinical characteristics including an infiltrative growth model, considerable tendency for recurrence, and preference for the mandibular molar area. Gene expression studies have demonstrated both similarities and differences when comparing ameloblastoma with the developing human tooth. The underexpression or overexpression of essential signaling molecules is believed to play an important role in the tumorigenesis of ameloblastomas. Although the biological subtypes share many common histological patterns, they are usually classified into two main types: the follicular type and the plexiform type. 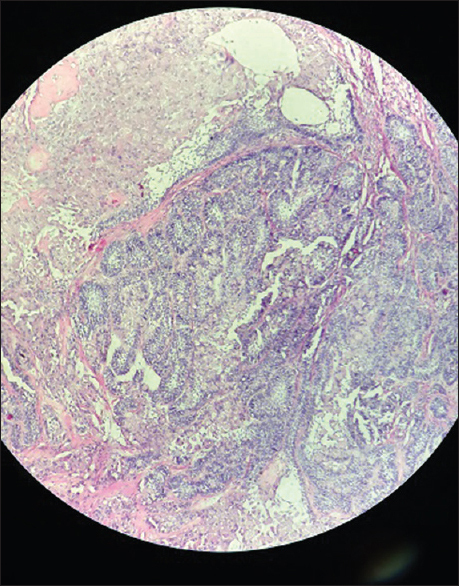 In the follicular type of the ameloblastoma, discrete epithelial islands surrounded by a layer of cuboidal or columnar cells can be observed. The cysts usually form within these islands. Microscopically, all ameloblastomas exhibit a fibrous stroma. In the plexiform type, the cyst formation occurs due to degeneration of this stroma, rather than the cystic change within the epithelium. Here, the tumor epithelium is organized as a network rather than islands. It was found that histologically follicular type is more associated with solid type, whereas plexiform type seems to be related with cystic type (determined by clinical and radiological findings). 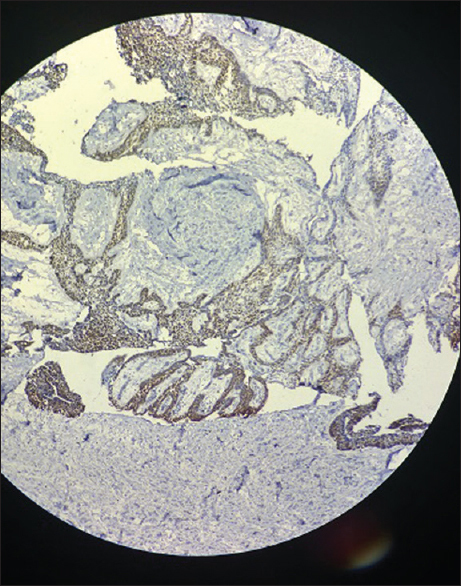 Another typical histological characteristic is the budding of tumor cells from neoplastic foci in a pattern similar to that present in developing tooth germ. HSPs are highly conserved proteins that can be found throughout evolution. They are induced by various physicochemical stresses, but they also fulfill protective functions. In normal situations, HSPs appear to function as molecular chaperones, being involved in protein folding, assembly, and transportation. On the other hand, during cellular stress, these proteins bind and prevent irreversible aggregation or misfolding of damaged or denatured proteins. As far as development is concerned, HSPs are among the first proteins produced during mammalian embryo development. They are essential for normal growing conditions. During development, HSP27 seems to play a crucial role in the specific development stages associated with cell proliferation, differentiation, and death., This immunohistochemical study in the developing tooth germs showed that HSP27 has a specific regional and temporal expression pattern during tooth development. This spatiotemporal expression tooth germs during the early stages of odontogenesis suggests specific roles for HSP27 during morphogenesis and cytodifferentiation processes of this organ. Therefore, it can be speculated that HSP27 expression might be related to the enamel organ histomorphogenesis and the ameloblast differentiation. Cytoplasmic positivity of HSP27 in the epithelial cells of dental lamina suggests the role of this HSP in the morpho- and cytodifferentiation of these undifferentiated odontogenic cells. As the tooth germ undergoes the process of differentiation and forms relatively differentiated cells like the IEE, which differ morphologically from the dental lamina cells in showing reversal of nuclear polarity, the expression of HSP27 declines. Cells of ameloblastic fibroma showing positivity can be explained by the fact that they might represent primitive odontogenic epithelium. An attempt to compare the expression of HSP27 in ameloblastoma revealed a similar pattern of immunostaining where the tumor cells of plexiform ameloblastoma showed greater positivity than the basal cells of follicular variety showing reversed polarity. Thus, it can be contemplated that the pattern of expression of HSP27 seen in ameloblastomatous cells was similar to that of different stages of tooth development and that it might play a role in their differentiation, thus affecting their growth potential. The genetic and molecular features of ameloblastomas are still poorly understood. As amelobastomas are characterized by a slow growth, their development may initiate in childhood. The histological similarities between these odontogenic tumors and the fetal odontogenic tissues also warrant a better understanding of the tooth development at histological level. The fact that the posterior end of the dental lamina proliferates continuously and that aberrant tooth germs most often are found in this region has been proposed as the statement for why ameloblastomas occur most frequently at the angle of the mandible. HSP27, a chaperonal protein, which plays a role in differentiation of growing cells can be taken up as a marker of differentiation of ameloblasts along with other proteins such as cytokeratin19. Further investigations with more samples are needed to firmly establish the role of HSP27. Fujita M, Nakano K, Funato A, Sugita Y, Kubo T, Maeda H, et al. Heat shock protein27 expression and cell differentiation in ameloblastomas. Int J Med Sci 2013;10:1271-7. Lanks KW. Modulators of the eukaryotic heat shock response. Exp Cell Res 1986;165:1-0. Lindquist S, Craig EA. The heat-shock proteins. Annu Rev Genet 1988;22:631-77. Landry J, Huot J. Modulation of actin dynamics during stress and physiological stimulation by a signaling pathway involving p38 MAP kinase and heat-shock protein 27. Biochem Cell Biol 1995;73:703-7. Huot J, Houle F, Marceau F, Landry J. Oxidative stress-induced actin reorganization mediated by the p38 mitogen-activated protein kinase/heat shock protein 27 pathway in vascular endothelial cells. Circ Res 1997;80:383-92. Leppä S, Sistonen L. Heat shock response – Pathophysiological implications. Ann Med 1997;29:73-8. Kregel KC. Heat shock proteins: Modifying factors in physiological stress responses and acquired thermotolerance. Ann Med 2002;29:73-8. Ciocca DR, Oesterreich S, Chamness GC, McGuire WL, Fuqua SA. Biological and clinical implications of heat shock protein 27,000 (Hsp27): A review. J Natl Cancer Inst 1993;85:1558-70. Houry WA. Chaperone-assisted protein folding in the cell cytoplasm. Curr Protein Pept Sci 2001;2:227-44. Haslbeck M, Buchner J. Chaperone function of sHsps. Prog Mol Subcell Biol 2002;28:37-59. Laskey RA, Honda BM, Mills AD, Finch JT. Nucleosomes are assembled by an acidic protein which binds histones and transfers them to DNA. Nature 1978;275:416-20. Arrigo AP. SHsp as novel regulators of programmed cell death and tumorigenicity. Pathol Biol (Paris) 2000;48:280-8. Sehic A. Understanding ameloblastomas through tooth development. J Dent Oral Care 2015;1:4. doi: org/10.15436/2379-1705.15.023. Neuer A, Spandorfer SD, Giraldo P, Jeremias J, Dieterle S, Korneeva I, et al. Heat shock protein expression during gametogenesis and embryogenesis. Infect Dis Obstet Gynecol 1999;7:10-6. Morange M. Temporal regulation of gene expression. J Soc Biol 1999;193:395-400. Davidson SM, Morange M. Hsp25 and the p38 MAPK pathway are involved in differentiation of cardiomyocytes. Dev Biol 2000;218:146-60. Leonardi R, Barbato E, Paganelli C, Lo Muzio L. Immunolocalization of heat shock protein 27 in developing jaw bones and tooth germs of human fetuses. Calcif Tissue Int 2004;75:509-16.